Today is our community’s second Big Share — a 24-hour online fundraising event to benefit the 70 nonprofit member organizations of Community Shares. Those groups, which include Wheels for Winners, Wisconsin Women’s Network, Madison Audubon Society, Disability Rights Wisconsin, Wisconsin Council of the Blind and Visually Impaired, League of Women Voters of Wisconsin, Wisconsin Farmers Union, Physicians for Social Responsibility, 1000 Friends of Wisconsin, and many more, are working toward a fair, just community and protection of our natural resources. 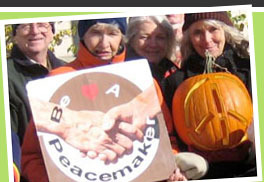 If you go today to the event’s web page, you can check out the sub-pages of the nonprofit members of Community Shares. There you can learn about the organizations and direct a donation, if you wish, to the group or groups of your choice. There’s also a text-to-give option available. The event began at midnight and ends at midnight tonight. Like last year, cash prizes from local businesses can add to the value of an individual gift. Businesses that are offering incentive prizes or hosting special events during the day today include Mini of Madison, ZenDesk, Home Savings Bank, Delta Properties, National Guardian Life, MGE, Sprinkman Real Estate, Madison Community Foundation, Supranet, Plan B, Java Cat, Yelp and others. Find out about the special events by checking out Community Shares’ Facebook page or their events page on Facebook. Last year, in its debut in our area, the Big Share raised over $232,000 from 1,750 donors. Community Shares Executive Director Crystel Anders says that in addition to the substantial funds raised for the nonprofits, the Big Share had the added impact of engaging new people in local organizations. If you’d rather donate by mail or in person, that’s fine. You can mail your donation to Community Shares, 612 W. Main St., Suite 200, Madison, WI 57303, or drop it off today between 8 a.m. and 6 p.m.